I recently wrote an article outlining how to remove the login screen user list in the KDE login screen. This article outlines the same steps, but specific to the GNOME login screen. The instructions here have been tested on Ubuntu 10.04 LTS as well as Ubuntu 9.10. If you would prefer to remove the user list from your login screen and require the username be entered in combination with the password, these instructions will achieve just that. I believe it was with Ubuntu 9.10 that the GDM login manager was rewritten and the previous configuration options removed. I know there was a lot of upset about that when it happened. The functionality seemed to be the same, but the configuration options that users had grown used to were now gone. It seems, however, that there are still some settings that can be changed. Perhaps not quite as many, but one of the important ones is still available. If slightly obscure. There are two methods of updating this configuration. There is the command-line one-liner, which I like for it’s quick and easy use. There is also the graphical method. I’ll outline both below. You can follow whichever you feel most comfortable with. The next time you log in you’ll be prompted to enter your username and password, instead of selecting your username from a list. 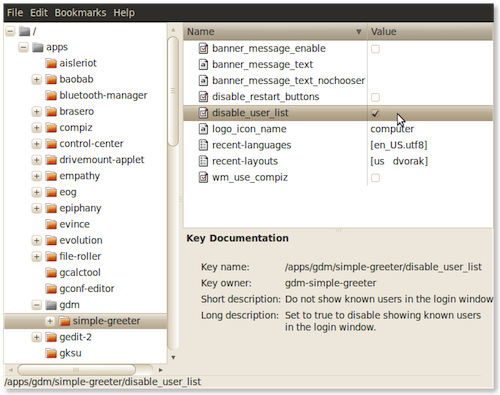 To disable the login screen user list in Ubuntu 10.04 graphically, run the following command and then navigate to the proper key=value pair setting. Check the box that says “disable user list”, setting the value to true. Whichever method you choose, you’ll end up with the same result. Disabling the list of users at the login screen. I prefer my machine to require the username + password combination. No reason in telling everyone who the machine belongs to, and removing half of the security of the login mechanism. I am interested in hearing your thoughts on the security vs usability of a user list at login. Do you agree with me or disagree? I completely agree with you; I would rather have to type in my username when I login for the extra security. Thanks for the instructions! It is very nice to know how to disable a login screen if one doesn’t like it. However, it would be better if one could select particular users to show in the list while hide other users. This would add more flexibility. Is there a way to do this? I have a problem with mythbuntu!! After I installed the pkgs from my repositories, it locked up my system completely!! I’ve tried so many things, I’m now brain dead!!! I just wanted to try the pkgs. and see what it offered….NOW – I can’t get into my ubuntu distro 10.04…. Upon start up, mythbuntu splash screen appears, as opposed to the normal ubuntu screen,,,then a black screen appears with a tiny line at top with a 24hr. clock??? I can get into cmd prompts , but don’t know which ones to use to retrieve my gnome system?? OR how to delete entirely mythbuntu!!! sudo apt-get remove mythbuntu ….says can’t find pkgs???? I have an old live cd of 8.10 -= it finds the files but gives no option to delete them? I have an ISO of 10.04 but wasn’t made on this machine (dell dimension 4550) I made it on my laptop with 9.10 and it burned just fine with native software….Ican’t get it to run on my Dell!!! Got to be a way to retrieve my good working distro…? Thanks for reading and help / suggestions. Thanks for posting this tip. I agree entirely – having a list of usernames to select from immediately halves how much work someone has to do to get onto your system, and might even give them pointers for “obvious” passwords! Much better to insist that a user types in their username as well as their password. Hi, I’ve used this solution in Ubuntu 10.04, but now when I go to the login screen the first thing I see is a box that says login. I have to click (or hit enter) on login, before being asked to write my username. Is this happening to everyone? Any ideas on how to avoid this problem? Another thank you. Why indeed advertise the list of users to hack? I am curious how gdm chooses the list of names. I am trying to add a system user that does not have a login, which only runs a daemon. Yet, despite inserting no profile and no shell for the user, Ubuntu still wishes to add this daemon to the user list. Odd. I would like to cancel the login screen altogether, and enter immediately into my desktop, since this is a private computer and I don’t need the security. Is this possible? Thanks for the info. I still don’t understand this new urge by OS maintainers to provide a handy list of valid usernames to potential hackers. This articles was very usefeull. And I want to add that, Ubuntu 10.10 brings with it a configuration tool located at ‘System/Administration/Login Screen’. It allows to do the same thing. But still that user is coming at the login prompt when I try to login to Ubuntu 10.04 lts. Please let me know how to resolve this issue. Thanks in anticipation. I agree with some people out there, there are people that doesn’t like to see the start up log in screen. For me, security is still very important. Thanks for this by the way. At least I learned that this is possible to Ubuntu. I’m still newbie anyway. In Ubuntu 10.04. How do I disable “other” option during login . I should be able to see only the list of users available . how to delete the other option.